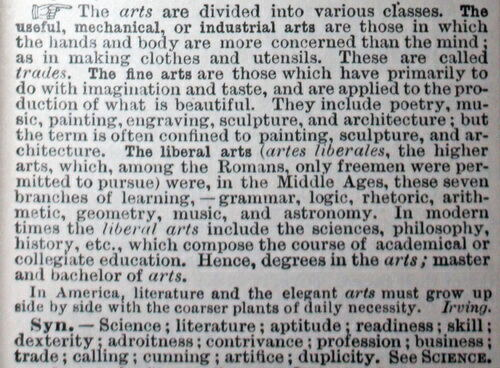 The arts are divided into various classes. The useful, mechanical and industrial arts, are those in which the hands and body are more concerned than the mind; as in making clothes and utensils. There are called trades. The 7 mechanical arts teaches manual labour, primarily that to do with the body, with a basic understanding of language and mathematics involved in a compartmentalizing of subjects. The fine arts are those which have primarily to do with imagination and taste, and are applied to the production of what is beautiful. They include poetry, music, painting, engraving, sculpture, and architecture; but the term is often confined to painting, sculpture, and architecture. The fine arts consist of 7 general forms that the body can perform. The primary focus of study to present beautiful fine art is the Quadrivium. These arts are useful to the autodidact polymath, in that they help to balance the left and right hemispheres of the brain, and thus enable the viewer to be inspired to new heights of awareness; primarily through music, rhythm and resonant frequencies in colour, sound and movement. A fine artist on the other hand maybe limited in ability and scope to expand into new fields of awareness and grow with the changing seasons of life; this is due to the lack of having gained the liberal arts first and a systematic method of learning for themselves. 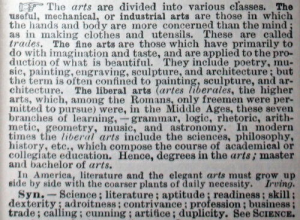 The liberal arts (artes liberales, the higher arts, which among the Romans, only freemen were permitted to pursue) were, in the Middle Ages, these seven branches of learning, –grammar, logic, rhetoric, arithmetic, geometry, music, and astronomy. In modern times the liberal arts include the sciences, philosophy, history, etc., which compose the course of academical or collegiate education. hence degrees in the arts; master and bachelor of arts.